Engaging students fully for four months can be tough, even in upper division courses, and having students gain a deeper understanding of the material adds to the challenge. Tangible/Alternative Projects (TAPs) offer a different outlet. The goal of TAPs is to create something tangible that relates directly to the literature of the course. 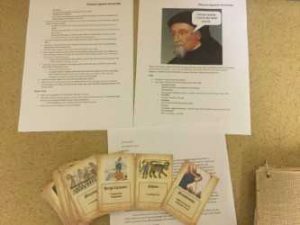 This project is done in lieu of a traditional research essay, but there is extensive research done before the tangible side is completed. The overall project is a semester-long project. Students select a particular theme, from a list or one they choose, and research that theme by way of producing annotated bibliographies, a book review, and an overview of where they intend to take the research for the tangible side and how they intend to complete it. This is what I call the thematic side of the project. Students then work on making the thematic side come to “life”; within reason, I want them to adhere as closely as possible to the methods of the period. For example, I joined the first class in the project in 2015, which was a Chaucer class, by making chain mail. Of course, I’m not forging the metal and riveting it together, but I am using steel wire to make the rings and then joining them in one of the specific patterns used during the Middle Ages. This is tedious work! Others have made clothing (a dress, a monk’s robe), games, paintings (some attempting to make paint in the Medieval method), books, paper, masks, and food. So why do this in an English course when “standard” research is the norm? Maybe because that standard needs to be questioned, but I truly believe that this type of research yields a better understanding of the literature at hand. Students are forced to read very closely to find the details to create, they engage in alternative methods of thinking and processing that information, and they, in turn, have a deeper investment of and within the material by moving it out of the theoretical and into the practical. And here’s a secret: it also works in non-major survey courses. 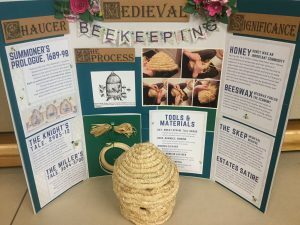 In a sophomore level British Literature course, 29 out of 32 students chose to pursue the tangible project instead of the traditional series of essays. Do students always succeed in what they start out to do with these projects? Nope, but I encourage them to reflect on those failures. Back with that first class, I really wanted to finish my chain mail and have a cool artifact to show off to them and other classes. Instead of a thigh length, sleeved shirt, I barely had a working vest that did not even reach my navel. 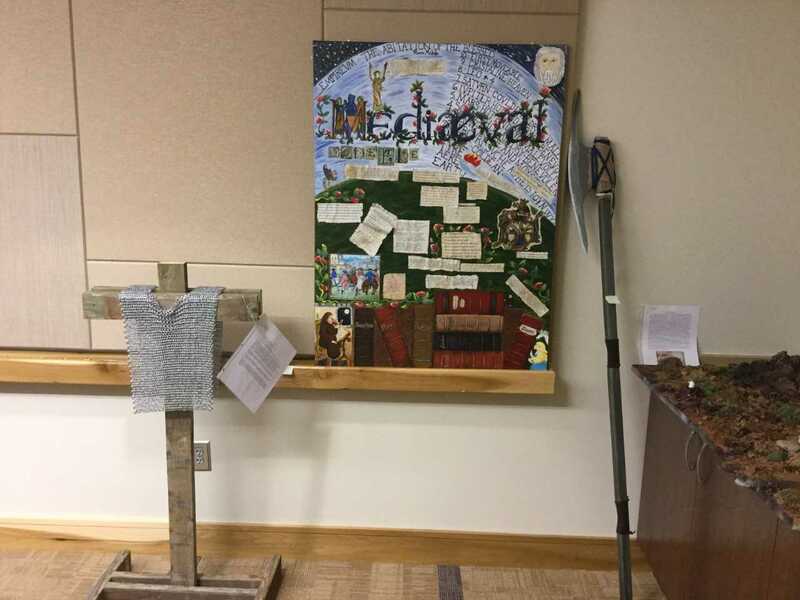 I learned that chain mail was difficult to make, expensive to own, and a valuable commodity, all aspects depicted in various Medieval pictures and stories of knights and battles I had seen and read for years but never fully considered. Most of my students have similar reactions. 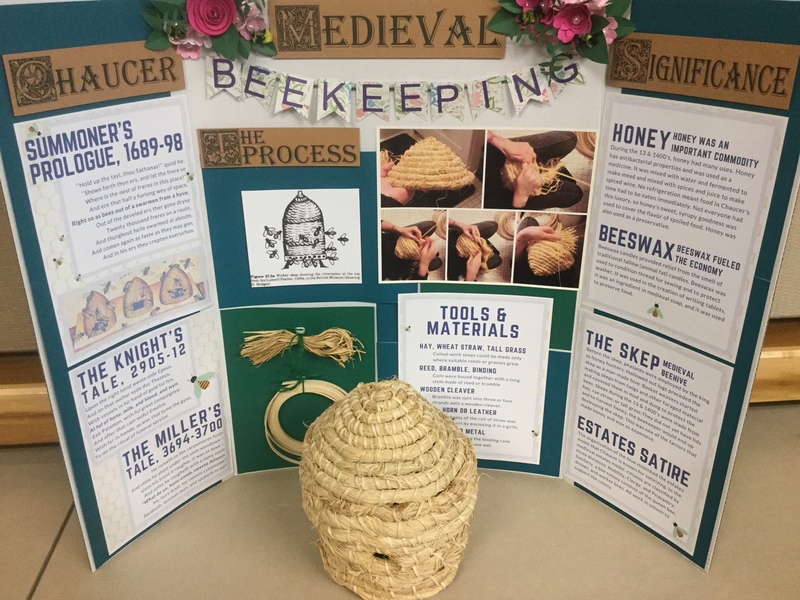 In the end, tangible projects like this take the positives of traditional research and move that model forward in a better, deeper mode of learning. House: A Journal of Educational Strategies, Issues and Ideas, vol. 83, no. 2, 2010, pp. 3 9–43. Supporting the Learning.” Educational Psychologist, vol. 26, no. 3&4, June 1991, pp. 369–398. They Matter. Association of American Colleges and Universities, 2008.